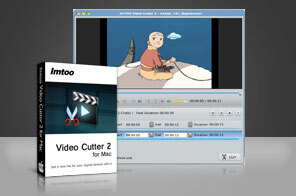 Introducing ImTOO Video Cutter for Mac. The next-generation video cutting software! With this easy-to-use programme, any user from a video-editing whizz to a video-editing "newbie" can cut, clip and customize their video segments as they wish! Our in-built player will allow you preview your videos before they are exported. Incredibility user-friendly interface allows you to precisely chip and chop what parts of the video you would like to keep, and which parts you would like to discard. Dozens of parameter options will allow you to output the video exactly the way you want it, anytime you want it! Award-winning software with a magically easy to use interface will have you cutting and chopping videos like a pro in seconds. Choose from over 30 input and output formats including AVI, MPEG, WMV, MP4, FLV, MKV, H.264/MPEG-4, DivX, XviD, MOV, RM, RMVB, M4V, VOB, ASF, 3GP, 3G2, SWF, H.261, H.264, DV, DIF, MJPG, MJPEG, DVR-MS, NUT, QT, YUV, DAT, MPV, NSV and more. Choose from different video formats, quality levels, bitrate selections, frame rate selections, zooming selections, and much, much more. Choose from English, German, Spanish, Italian, French, Japanese, Simplified and Traditional Chinese interfaces. Easy-to-use and pin-point markers allow you to clip your desired videos with ultimate precision. Built-in player allows you to seamlessly scan through your video and edit as you wish. User-friendly interface makes clipping more than one segment from a video a breeze. Various output options and parameters allow supreme control over your clipped videos. Timer included for precise clip capturing. Available in English, German, Spanish, Italian, French, Japanese, Simplified and Traditional Chinese interfaces. Transfer/backup/copy videos, music, photos among iPads, Mac, iTunes, iPhone and iPod.